Located right on the westernmost point of Santorini, Oia is justifiably famous for its magnificent sunsets, a must to experience for any visitor to the island. 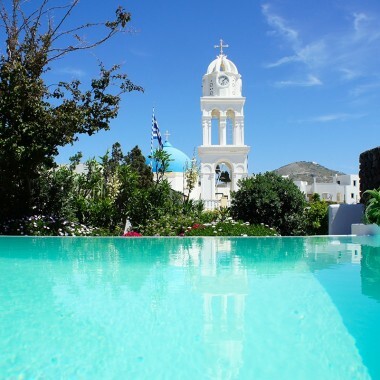 It is also well known for its charming pastel coloured houses, perched on the edge of the cliffs, about 150 metres above sea level, and white washed blue-domed churches. The picturesque narrow, winding streets are filled with galleries, boutiques, restaurants, cafes and bars. 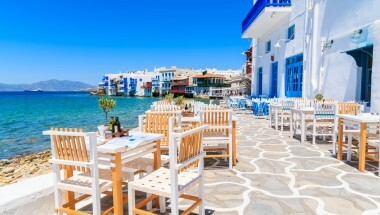 Aegean View is located near the entrance to the village, close to the main pedestrian street. This stunning rental villa in Oia benefits from an ultra-private partly covered terrace, fully equipped with sunbeds, outdoor furniture, and a fabulous plunge pool, which offers both relaxation with breathtaking Aegean and volcano views. The accommodation (40 m2) comprises a bedroom with a queen-size bed (with anatomic mattress treated with olive oil), a sitting area with sofa and coffee table, and a beautiful bathroom with hairdryer, shower, complimentary toiletries, slippers, bath and beach towels. The kitchenette has a mini fridge, hob, kettle and coffee machine, and a table and chairs. Amenities include flat screen satellite TV, air conditioning, safe deposit box and Wi-Fi access. Guests at Aegean View benefit from a range of exclusive services, which include a choice of enticing breakfasts each morning, served in a local café, or which can be delivered to the property at a small surcharge. Services included: Daily cleaning and change of towels Laundry and ironing (surcharges apply) Luggage carry and storage Complimentary bottle of wine upon arrival Complimentary coffee, tea, table water and juice Daily Breakfast (surcharge for delivery) Concierge service which can arrange a range of extras, including beauty treatments, airport/port transfers, car and motorbike reservations, sailing, day excursions and tours. 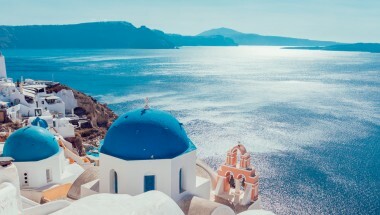 Located right on the westernmost point of Santorini, Oia is justifiably famous for its magnificent sunsets, a must to experience for any visitor to the island. Aegean View is located near the entrance to the village, close to the main pedestrian street, and benefits from a private partly covered furnished terrace,The fabulous plunge pool here offers breathtaking Aegean and volcano views.